Because of circumstances beyond my control, the garden is going to have to be either smaller this year or planned in such a way that it will require far less attention from me. Physically I seem to be struggling, so in order for Hubby to agree to a garden at all, I had to agree to some new terms. Man I hate getting old! Realizing I have some strict limitations, this year I have decided to try a few new crops that will hopefully prove to be fairly self-sufficient. 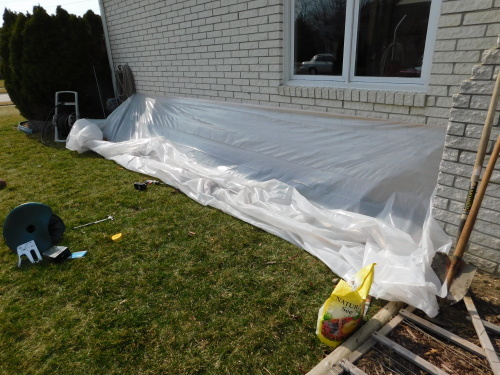 In order to protect them from the elements, however, and to get a jump-start in a Michigan spring, Hubby agreed to help me build a few make-shift greenhouses. Actually I wanted to make hoop houses, but as with most things, Hubby had a better idea. In this case, I do agree with him. The idea he came up with for the first area I wanted to work in, turned out very nice. Spring in Michigan is always unpredictable. One day you can have 70 degree temps and sunshine and two days later you can have 20 degree temps and three inches of snow. Such has been the case since early February around here. So, even though the weather predictions were for 50 degree weather for the next ten days, I know from experience that these forecasts are less than reliable. Thus my justification for wanting to build an enclosure for early spring planting. There are a lot of crops that can be planted as early as mid-March in Michigan, depending on where you are located. I am near the southern part of Michigan, so mid-March is perfect for this type of early planting. Peas, carrots, turnips, beets, potatoes, lettuce, broccoli, cauliflower, and cabbage are just some of the possibilities. My choice for our first project this year was lettuce. We have been eating salad nearly five times a week with dinner and have been enjoying a wide variety of lettuces. Growing our own sounded like a fun new challenge and being that many of the lettuces out there continue to grow all season, I couldn’t wait to get started. The first step was to prepare the area. 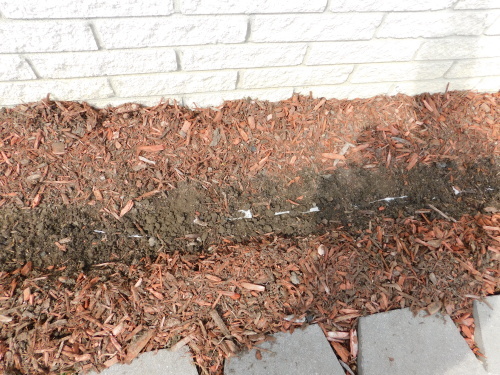 All I really had to do was make a path down the mulch covered bed, dig a little trench, place the seed tape in the trench (can’t get any easier than seed tape), bury the tape, water, and cover with a little organic dirt. I am so glad I took the time last fall to clean up and prepare most of the gardens for the following year. This should hopefully mean a quick and easy beginning to the gardening season. 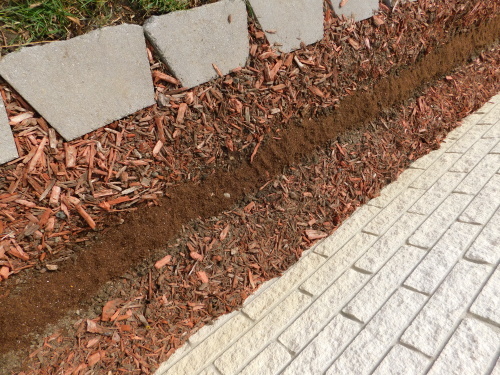 Slight trench in prepared bed. 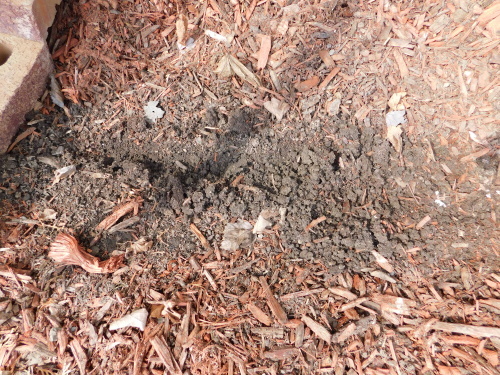 Seed tape placed in trench, covered lightly with soil. Organic soil placed on top of trench. Once I was done with the little bit of work it took to get the lettuce seed tape planted, Hubby came out to work on the greenhouse. He decided that attaching one side of the greenhouse frame to the house would be the easiest method. I never would have thought of that, as I can never drill into the mortar without messing up the holes for the screws. Hubby got this done without any problems. 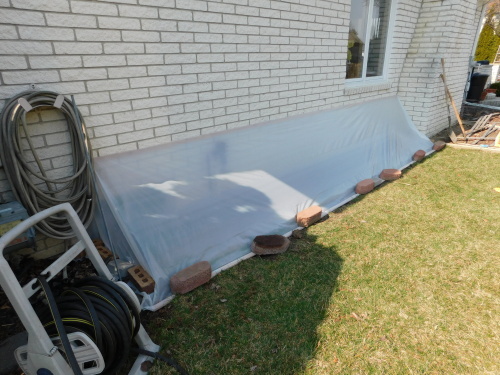 I attached the plastic to the boards that we then attached to the house and then simply attached the other side of the plastic to more boards, trimmed the plastic, and secured the boards to ground with bricks. 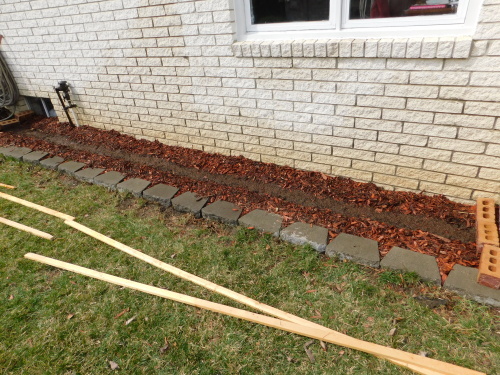 Spring can be very windy here in Michigan, especially come April, so staking the boards would not be enough. Several bricks along the length of the boards should hopefully get the job done. In a matter of two hours the lettuce garden was planted and protected, and just in time. Because although it was nearly 74 degrees here yesterday and sunny, the temps went down into the upper 30’s last night and we have had heavy rain and winds all day today with temps in the 40’s. If I’d left the lettuce bed to the elements, I’m sure my seeds would be long washed away. As it is, the lean-to greenhouse is holding up well, and the ground is still quite warm because of the insulation of the plastic, and for this I am — Simply Grateful. Categories: Plant Protection | Tags: Easy Greenhouse, Lean-To Greenhouse, Lettuce planting, Make-shift Greenhouses, Michigan planting, Spring planting | Permalink.